46956 miles with full bmw service history inc running in service. Mot untill 11/10/19. Gts software update on gearbox, rear diff and steering. The car has been serviced regularly with most of the original receipts kept with the car over its life, it has had the all important first service at 1076 miles, the MOT history shows that the car has consistently done on average 4k miles per year. They are also achingly cool, because who doesn’t like an overpowered saloon car – and BMW have been making the best of them for years (sorry AMG and Audi). It’s super rare now to find a saloon with the correct ‘Contour’ wheels that are in the proper OEM finish. A full list of modifications can be found below, but to summarise I've spent over £5000 on engine modifications including a hybrid turbo upgrade, the car is pushing in excess of 450bhp. The car also has an active air suspension system. 2004 BMW M3 E46 SMG. Black with black interior. BMW m3 replica. M3 wide arches all the way round. M3 bonnets. M3 front and back bumper. M3 side skirts. M3 twin exhaust. Car looks like a real M3. 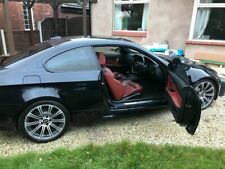 Car is in cherry red with black roof and black m3 alloys and black mirrors. E92 M3 Coupein Alpine white, 99k. 612: BMW assist. 616: BMW assist online portal. BMW service history up to 2013 and then done by specialists and independents. Both actuators replaced, just had a new MOT so good until the end of March 2020. 2014 BMW M3 Pearl essence white 2x keys. This M3 is in superb condition for its age and being the drop top E93 coupled with the amazing sound of that V8 - a real head turner! HPI clear. Always kept in a locked garage. I'm more than happy to send details of the paper work, pics - references etc. It has been a pure leisure car in which I have driven 41k, rarely in the rain and it has always been garaged overnight. It now stands at 81.6k miles. Having decided on a CS, I spent 5 months searching for one with the right history and condition. 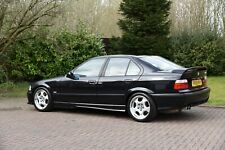 BMW E46 M3 manual, low miles, rare interior, great condition. Much loved e46 m3 74500 miles on the clock. The seats were re coloured at great cost late 2018, the drivers bolster shows a slight bit of polishing since then but looks far better than any other m3 of this age. FOLDER FULL OF RECEIPTS AMOUNTING TO OVER £13,000. NO KNOCKS OR BANGS - MOST OF THE SUSPENSION HAS BEEN REPLACED - RECEIPTS TO PROVE. CUSTOM LEATHER INTERIOR WITH WHITE STITCHING - FULLY ELECTRIC AND HEATED. The car also has electrically adjustable AC Schnitzer mirrors, which are rarer than rocking horse deposits. Exterior: finished in Diamond Black, (Code 181). The car also had a new BMW windscreen fitted with the correct original green top tint. Bmw 2002 M3. And this M3 did not dissapoint. Car is unreal never fails to put a smile on your face. Very well maintained and looked after. Only used as a weekend car in the good weather. Best of both worlds being the convertible with the car top. BMW M3 Convertible 3.2, SMG, low miles, 2 owners, full history, exceptional. Appreciating Modern Classic for the enthusiast. Bumpers could do with aligning a bit but it’s an e46. The wheels have been reconditioned and have a matching set of pirelli P0 tyres to manufactures size. Yearly service with all BMW parts and the correct oil. BMW M3 e46 SMG Convertible 2005 Low Miles. 2005 E46M3 SMG which has covered just over 78,000 miles with full service history andhad a new SMG pump at just 68,000 miles with receipt for proof of work carriedout. Also it had both rear coil springs replaced and the hex Nut, plus bothtrailing arms and mountings replaced again receipts to show work carried out(71000 miles). The lining is all straight and it drives perfect. - Full M3 CS Carbon fibre kit plus more. - CS rear spoiler. - Competition rear m3 badge and wing vent badges. - CS front splitter. - CS side skirts. - Aluminium trim.